Video Kiosk: How to Create an XML Schedule File. This video shows you how to create an XML Schedule file to control the playback on Video Kiosk – Android. In Video Kiosk > Settings > File and folder > Sort by, choose Path or first playlist found since the other Sort by settings (Path, File name excluding path, Random shuffle) take precedence over scheduled playback and so scheduling won’t work with those other settings. In a Text Editor or XML Editor, create an XML file, with the extension .xml. When you have finished editing the file, change the file extension from .xml to .schedule so Video Kiosk will recognize it as a Schedule file. 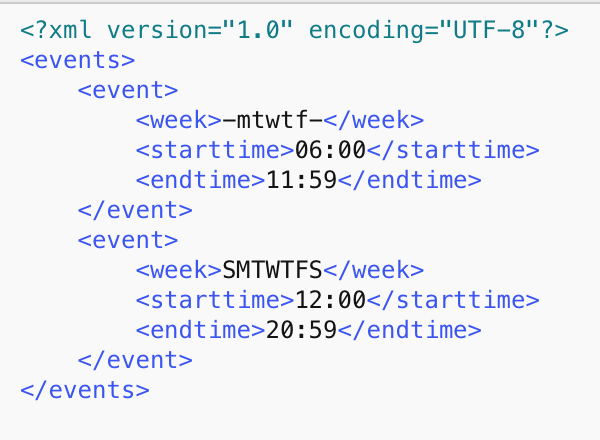 For file content requirements, refer to the Video Kiosk XML Schedule file Syntax Guide, below. Configure Video Kiosk with the location of the playback schedule. You can configure the location of the Schedule that you want in two ways, by putting the schedule file in the default location or by setting the path to the schedule file in the App Settings. To use the default location, create a schedule file called VideoKiosk.schedule and put the schedule file in the same folder as your content files. Video Kiosk will automatically use this as the Schedule File. and set the path to the schedule folder. and select the schedule to use. Video Kiosk > Settings > Schedule > Display Clock and set to on. You can change the clock color using the Video Kiosk > Settings > Schedule > Clock Color You can change the clock format (12 hour AM/PM versus 24 hour) in the System Settings for the device. Off for events, otherwise on, the schedule event will turn the display off. The week tag is used to define the same event occurring on multiple days of the week, using a string of the form SMTWTFS, where each day of the week uses the first letter of the days name. If you want the event to occur on a day, use the letter for the day’s name. If you want to skip a day, use a dash character (–) instead of the first letter of the day’s name. It’s important that the string always contains all 7 characters. If you use any other number of characters, the event will be ignored. NOTE: When creating an XML file, please do not copy and paste this example. Many web browsers will insert the wrong characters when you copy and paste; most notably, they get the double quote character wrong. If you don’t want to type from scratch, download the sample file and step-by-step instructions using this link.